I have over a decade of experience playing weddings around the MD/DC/VA area, mostly with Music By Anthem. If you are interested in a string duo (violin-cello), trio (2 violins + cello) or quartet (2 violins, viola + cello) for your wedding, please contact Music By Anthem. Solo cello can be a wonderful addition to your wedding ceremony. As a soloist, I typically provide up to 30 minutes of prelude music while your guests are being seated (a variety of Bach, Vivaldi and light classical pieces), traditional processional & recessional selections (Bach cello suites work great for this too - check out a sample here), and any interlude music you might want during the ceremony. I can often accommodate special music requests (including pop/modern selections) if made at the time of booking. I have also performed at Catholic & Episcopal wedding masses as a soloist with organ accompaniment. If sheet music is provided, I can play along with other selections included in your religious service. Additionally, I can provide up to 45 minutes of light classical solo cello for your cocktail hour, if desired. - My acoustic cello is unamplified. This works well for most small-to-medium indoor settings, and for small outdoor weddings. If your wedding is in a very large indoor room, or you’re having an outdoor wedding with more than 100 guests, you may want to consider electric cello (which has a very realistic acoustic cello tone). I bring a small battery-powered amplifier that can produce more volume. - I generally play a carbon fiber acoustic cello, which is much more resistant to temperature and humidity extremes than a wooden instrument. A little rain drizzle won’t hurt it. However, at temps lower than 55 degrees or higher than 90 degrees, I’m not only uncomfortable – your guests (and you) probably will be too! If you are planning an outdoor wedding, I strongly recommend an indoor contingency plan for temperature extremes. If playing outdoors, I require a covered or shaded area, as sitting in direct hot sunlight can affect my instrument. - I require a 50% deposit (check or Paypal; I also accept credit cards through Square with a small fee to cover processing) to confirm your booking, with the remainder due one week before your wedding date. I can also accept a balance payment at the wedding - but as a married person who’s gone through this herself, I can tell you it’s a lot easier to get all your payments squared away in advance so you don’t have to worry about it. - I support Marriage Equality and all couples! My bands ilyAIMY (original folk-rock with a varied selection of covers “our way”) and Lulu’s Fate (old-time Appalachian) also perform at weddings, if you’re into what we do! 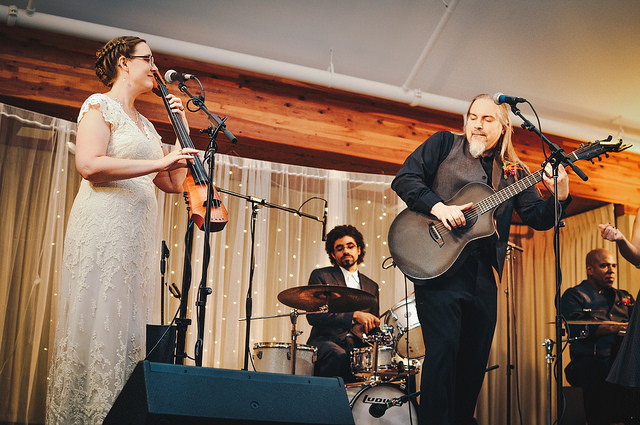 Yes, I even played at my own wedding!